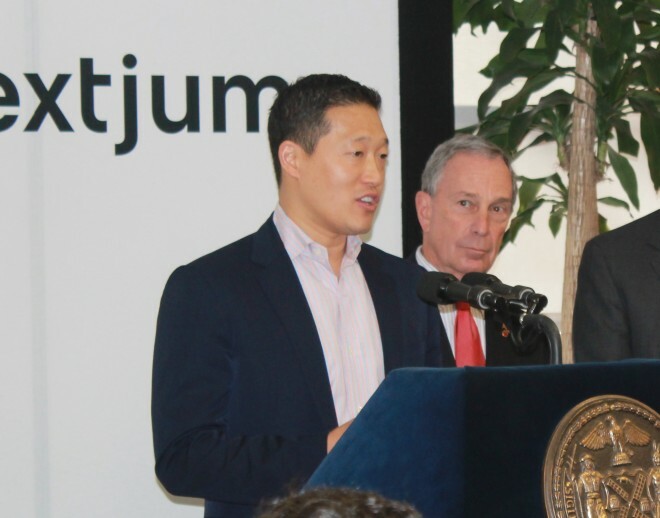 Next Jump CEO Charlie Kim with Mayor Mike Bloomberg. Photo courtesy of Next Jump. New York-based Next Jump is a data-driven rewards and offers company working at the juncture of three quintessentially New York City businesses: advertising, publishing and commerce. Between its annual Silicon Valley 500 event and other efforts, Founder and CEO Charlie Kim estimates that he and his company probably have invested more in recruiting software engineers out of college than any company on the east coast. “If Boston has gone down [as a center for startups] and Silicon Valley has stayed flat, then New York is going up,” Kim says. Kim knows Boston’s tech scene well, having started Next Jump in his dorm room at Tufts. After settling in New York, he resisted pressure to take Next Jump out of the city for easy venture capital money in California through two different tech booms in the ’90s and ’00s. He’s an ambassador for the city, proof New York is a place where you can build a successful, lasting technology business. So when New York Mayor Michael Bloomberg convened an advisory committee of university presidents, entrepreneurs, venture capitalists and other experts to evaluate seven proposals to build an applied science and technology campus in the city to help attract and retain new tech talent and businesses, Kim was a natural choice. A joint proposal by Cornell University and Technion-Israel Institute of Technology won the initial competition. Cornell, which already has a substantial footprint in Manhattan, will begin hiring and admitting students as early as next year while it works to build a new campus on city-donated land on Roosevelt Island. Among other proposals, Cornell and Technion beat — or at least outlasted — Stanford University, the school whose marriage of high-tech smarts and entrepreneurial verve in Silicon Valley Bloomberg wanted to reinvent in New York. Stanford unexpectedly withdrew its bid shortly before the results were announced. “Stanford was inherently conflicted from day one,” Kim told Wired . After all, Mayor Bloomberg didn’t propose that New York would match or follow Silicon Valley or Boston-Cambridge as high-tech hubs. He proposed to make New York City the best in the world. “If you want to be number one, Silicon Valley has to be number two,” Kim says. It was harder for Stanford to commit itself and its resources to that vision than Cornell or many of the other bidders. Not without causing serious agita back home in Palo Alto. The New York Times‘ Richard Pérez-Peña has a fine play-by-play of how Cornell and Technion partnered up, more or less under everyone’s radar, to win the bid. Cornell and Technion each offered something the other didn’t: Cornell’s stateside prestige, endowment and experience in New York, and Technion’s proven ability to spark high-tech business development. But if Pérez-Peña’s story helps to tell part of the universities’ side of the story, Kim was able to show Wired something of how the mayor’s office and advisers approached the proposals.